Capitals Outsider takes an offbeat look at the Washington Capitals, their fans, and the coverage of the team. Despite the ‘outsider’ attitude, we actually do get a scoop every now and then with player, coach, and alumni interviews. We’re also actively looking for contributors. Got something to say about this team? Join us. To contact the editor, e-mail Ben. 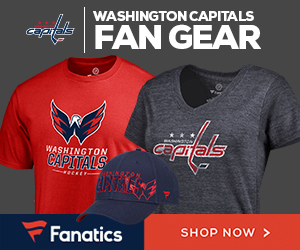 This site is strictly for informational and entertainment purposes, and is in no way affiliated with the Washington Capitals or the National Hockey League. Both “Washington Capitals” and the Washington Capitals’ logo are official trademarks of the Washington Capitals organization and the National Hockey League. This is an unofficial site which claims absolutely no rights to these trademarks. The opinions and views expressed on this site are definitely not the views of the Washington Capitals or the NHL, except when opinions and views are clearly stated as such. Washington Capitals team name, logos and uniforms are registered trademarks of the Washington Capitals. Other NHL teams’ names, logos and uniforms are also registered trademarks of the teams indicated.